How do I identify the year, make and model of my car? The easiest way to identify the year, make and model of your car is to read off the registration ticket, located at the left bottom of the front windscreen of the car. How do I find the specifications of my car? 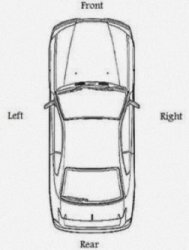 How do I determine the left and right sides of a car? The right and left sides of the car are determined from the point of view of being seated inside the car, facing towards the front of the car. In New Zealand, the driver's position is on the right side and the passenger's position is on the left. The chassis number, also known as the frame number, is written on the factory chassis tag of the car. If you are having problems locating factory chassis tag, the chassis number is also written on the top of the front strut towers or on the fire wall. How do I identify the lights of my car? Original equipment manufacturers place a part number on every part. We use the part number of the lens, also called the lens number, to identify the light. The lens number is often found embossed on the lens of the light, however, there are examples where it is embossed on the housing. Do not use the lens number of the reflector of the light. For some examples, the lens number is followed by an ‘L' or ‘R' which denotes the side (left or right) of the light. If it is not possible to identify the lens number of the light due to the damage, the light on the opposite side should have an identical lens number. How can I tell how many wires (pins) my door mirror has? For manual door mirrors, there are no wires (pins) attached to the door mirror. However, for electrical mirrors, the number of wires varies depending on model. The easiest way to determine how many wires your door mirror has is to remove it from the car body and count the number of wires attached to the electrical plug. However, if that is not possible, the number of wires can be determined by the features the door mirror has, such as electrical retract ability and mirror heating. Where can I find the ignition number? The ignition number refers to the original equipment manufacturer's part number for the ignition key barrel. The ignition number should be embossed on the body of the ignition barrel. Depending on the make of the car, the ignition number varies from 4 to 6 characters. If it is possible, bring along the original ignition barrel from the car when visiting us. This is to ensure that we supply you with the exact same part for your car. Where can I find the engine type to suit my car? The engine serial number is engraved on the engine. Another way is to look at the factory chassis tag of the car. The engine type is under "engine." Where can I find the transmission serial number of my car? The transmission code is usually engraved on the transmission. The transmission code is also detailed on the factory chassis tag of the car. The transmission code is under "trans/axle." How do I determine the stud pattern of my car? The first step is to count the number of lug bolts on one wheel. Passenger cars usually have 4 or 5 lugs. Commercial vans and recreational vehicles usually have 5 or 6 lugs. The next step is to measure the pitch circle diameter (PCD), which refers to the diameter of an imaginary circle drawn through the centers of the bolts. In the case where your wheel has an even number of bolts, measure the distance from the center of one bolt to the center of the opposite bolt. In the case where your wheel has a 5-bolt pattern, measure the distance from the back of one bolt hole to the center of the second bolt hole, as shown in the diagram. The most common PCD measurements for Japanese cars are 100mm and 114.3mm. What do I need to know before purchasing wheels? When purchasing mag wheels, the stud pattern, rim size, rim width, offset, and center bore specifications are important to ensuring proper wheel fitment for your car. The stud pattern of a wheel will have to be measured manually and the stud pattern of the wheel must match the stud pattern of the car. Most manufactures emboss the rim size and width on the inside face of the mag wheel. The offset of a wheel (often written as ET) is the distance from the plane of the hub mounting surface to the centerline of the wheel. Most manufactures also emboss this detail on the inside face of the mag wheel. The center bore (also known as the hub diameter) is the diameter of the center hole on the face of the mag wheel, expressed in millimetres (mm). If the center bore is smaller than the size of the axle, the mag wheel will not fit properly. Some aftermarket wheel manufacturers have wheel identification stickers, located on the inside of the wheel wall, which list all the wheel specifications. If possible, try the wheels on your car before purchasing to ensure the wheels fit nearly on your car (brake clearance and no guard rub). Otherwise, wheel and tyre fitment calculators are available online that calculate and illustrate the change in wheel fitment. How do I read my tyre size? Tyre manufacturers emboss the size of the tyre on the side walls of the tyre, this is usually a series of numbers accompied with a few alphabetical letters. The first three numerical characters correspond to the width of the tyre, followed by two numerical characters which correspond to the profile (also known as height) of the tyre. The radial construction of the tyre is the two number characters following the ‘R'. The load and speed index of the tyre are the last three characters of the series. Can't find an answer to your question? Send us your question and we'll be happy to answer it for you.